Summary: Childhood intracranial aneurysms are exceedingly uncommon. Diagnosis of intracranial aneurysms in infancy may be difficult because of their infrequency and confusing clinical presentation. Findings with routine radiographic methods may be misleading and difficult to interpret. We present a case of the rupture of an anterior communicating artery aneurysm in a 7-month-old child. The rupture had eluded diagnosis until contrast-enhanced MR imaging was performed. Intracranial hemorrhage due to cerebral aneurysm rupture is an uncommon diagnosis, but it must be unequivocally excluded. In rare cases, identifying ruptured cerebral aneurysms may prove difficult because of a delay in diagnosis and subsequent cerebrovascular spasm in a child with a stroke or strokelike symptoms (1). Cerebral angiography is the criterion standard for the evaluation of intracranial aneurysm in adults (2). Recent improvements in MR imaging technology have allowed for better definition of the intracranial vasculature, such that MR angiography has been used instead of conventional angiography for preoperative navigation (3, 4). However, cerebral vasospasm may severely restrict blood flow and impair the visualization of aneurysms with both conventional and MR imaging techniques. Although it is rarely used for the diagnosis of intracranial aneurysm, contrast-enhanced spin-echo MR imaging may be useful in defining a suspected aneurysm by enhancing its vasa vasorum when luminal flow is absent. We present here an unusual case of a 7-month-old infant with a large anterior communicating artery aneurysm that was confirmed on the basis of contrast-enhanced spin-echo MR findings. A 7-month-old male infant presented to the emergency department after he was observed to have a seizure at home. The patient’s history was remarkable for a 1-week episode of decreased feeding and persistent vomiting. The child was born by means of normal, spontaneous vaginal delivery after an uncomplicated pregnancy, and the postnatal period was normal. Initial examination in the emergency department revealed a dehydrated infant with normal development. No signs of trauma were identified. The child was postictal with marked left hemiparesis and a tense anterior fontanel. His pupils were slightly asymmetric, with slow response to light. Emergency CT scanning of the brain showed a left inferior frontal lobe hematoma extending to the suprasellar cistern (Fig 1). Blood was also noted to extend throughout the ventricles, with resulting hydrocephalus. The presumptive diagnosis was arterial hemorrhage due to either an aneurysm or an arteriovenous malformation. Possible child abuse was quickly ruled out secondary to the lack of evidence in the history and physical findings. Aneurysm was believed to be most likely because of the proximity of the parenchymal clot to the expected site of the anterior communicating artery. Nonenhanced coronal CT scan of the brain shows hydrocephalus and a left anterior frontal lobe hematoma extending into the suprasellar cistern. Digital subtraction angiography was performed on an emergency basis. Left common carotid injection revealed diffuse spasm of the left A1 and A2 segments of the anterior cerebral artery. Medial bowing of the left proximal A2 segment was noted (Fig 2). No aneurysm or vascular malformation was identified. Injection of the right common carotid artery showed mild ipsilateral bowing of the proximal A2 segment of the anterior cerebral artery, but findings were otherwise unremarkable. Because of severe spasm in the left anterior cerebral artery, the angiographic findings were thought to be unreliable. Therefore, 3D time-of-flight MR angiography was performed; this duplicated the findings of conventional angiography. However, sagittal T1-weighted (TR/TE, 510/17) MR images showed a predominantly isointense blood clot, consistent with hyperacute hemorrhage in the inferior frontal lobe parenchyma; this extended into the lateral, third, and forth ventricles (Fig 3A). Hyperintense blood products were also noted to extend laterally into the sylvian fissure, consistent with the presence of subacute blood, and therefore suggesting recurrent hemorrhage. In addition, a hypointense focus with a partial, hyperintense inner-ring margin was noted at the center of the parenchymal hematoma; this suggested the presence of an underlying aneurysm. Because the etiology of these findings was still uncertain, gadolinium-based contrast agent (Omniscan 0.1 mg/kg; Amersham Health, Princeton, NJ) was administered to possibly enhance the vasa vasorum of the presumed aneurysm wall. After this administration, prompt uniform enhancement of the outer spherical wall of the aneurysm was noted, confirming the diagnosis (Fig 3B). Cerebral angiogram shows diffuse spasm of the left anterior cerebral artery. Medial bowing of the left proximal A2 segment is shown. A, Nonenhanced T1-weighted image shows hyperacute hemorrhage in the frontal lobe parenchyma extending into the ventricular system. A hypointense ring with a partial, hyperintense inner margin was noted at the center of the parenchymal hematoma. B, Contrast-enhanced image shows enhancement of the outer wall of an aneurysm of the anterior communicating artery. Since the aneurysm was diagnosed during peak spasm and was found to be completely thrombosed, the child was treated with a ventriculostomy alone; this was slowly weaned over 2 weeks. He required no permanent CSF shunt surgery, and his head circumference remained stable. The left hemiparesis improved, and no residual focal neurologic deficits were present upon his discharge from the hospital. Subsequent MR imaging and angiography revealed resolution of his spasm and the presence of a thrombosed aneurysm. The child had no neurologic or developmental problems at 3-month follow-up. We present a rare case of cerebral aneurysm in an infant that was definitively diagnosed only with the help of contrast-enhanced T1-weighted MR imaging. This imaging technique is not routinely used in the workup of cerebral aneurysms, because it does not directly show the vascular structures. We suggest, however, that enhancement of the aneurysm wall may be helpful in making the diagnosis in the absence of definitive proof from the standard angiographic techniques. We propose that a mechanism responsible for this phenomenon may be related to presence of vasa vasorum in the aneurysm wall. Recent pathology studies have shown the definite presence of the vasa vasorum in the proximal normal cerebral vasculature (5). Because of their small diameter, vasa vasorum in the circle of Willis cannot be visualized with the current state-of-the-art imaging techniques. However, several reports in the literature suggest that atherosclerotic vessels and longstanding thick-walled aneurysms may, in fact, have a significantly vascularized wall (6, 7). Another mechanism for contrast enhancement of the aneurysm wall is neovascularization in the granulation tissue present in the intraluminal thrombus. Furthermore, granulation tissue and concomitant neovascularization may be present in the extravascular space surrounding the aneurysm dome as a result of multiple unrecognized rebleeds. This may be particularly relevant for the pediatric population, since plasticity of the young brain (8) and the atypical presentation may lead to a delay in the diagnosis (9). The diagnostic workup of an infant with a suspected aneurysm is a challenging task. The most helpful clues come from a detailed account of the events by the parents. Especially useful findings are a history of meningismus, seizures, failure to thrive, tense fontanel, or lethargy. Meningitis and child abuse are important considerations in the initial encounter, and these must be investigated quickly and ruled out. Urgent CT scanning of the brain is an essential first step in the diagnostic workup. If the results are negative, a lumbar puncture to evaluate the CSF for xanthochromia is next. However, the patient’s age and the suspicion of increased intracranial pressure may make lumbar puncture inappropriate or its findings difficult to interpret. The presence of subarachnoid, intraventricular, intraparenchymal, or subdural hemorrhage with or without hydrocephalus should alert the physician to the possibility of an intracranial aneurysm. If an aneurysm or an arteriovenous malformation is suspected, the child should undergo four-vessel cerebral angiography under general anesthesia (10). Angiographic clues of a possible intracranial aneurysm may be limited because of cerebrovascular spasm (8). Furthermore, substantial morbidity is associated with cerebral angiography. MR angiography has been used successfully in the diagnosis of cerebral aneurysms (3, 4, 11). This technique, however, requires good intravascular flow, which is often severely restricted in the neonate with subarachnoid hemorrhage. In our patient, conventional four-vessel cerebral angiography and MR angiography failed to show the lesion, although severe spasm and mild displacement of the anterior cerebral artery segments still indicated that intracranial aneurysm was a likely diagnosis (Fig 2). Delayed contrast-enhanced MR imaging proved to be the single most important study to definitely outline the aneurysm wall and thus confirm the diagnosis. Intracranial aneurysms in patients younger than 18 years are reported to account for only 0.005–2% of all diagnosed aneurysms (2). The incidence appears to be particularly low in the neonate (younger than 4 weeks) and infant (younger than 2 years) populations. However, approximately 75% of children with aneurysms present with subarachnoid hemorrhage (12). The most frequent cause of subarachnoid hemorrhage in children is trauma or nonaccidental injury (10). In the neonatal period and infancy, male patients are affected more commonly than are female patients (13–16). Pakarinen et al (17) showed that the incidence of aneurysmal subarachnoid hemorrhage was less than 1% in the first decade of life. Neonates and infants often present with nonspecific signs such as irritability, seizures, drowsiness, or emesis. Childhood aneurysms are most commonly encountered at the carotid apex and the vertebrobasilar system (14, 16). Large (>1 cm) or giant (>2.5 cm) aneurysms are more common in children and are associated with mass effect and seizures (10). Children tend to present with conditions of clinical grades better than those of adults. Although vasospasm seems to be more severe initially, children also seem to be less susceptible to delayed ischemic deficits (18). The incidence of cerebral aneurysms is exceedingly low in the pediatric age group; however, we propose that aneurysms in children need to be definitively excluded from the differential diagnosis, rather than viewed as a diagnosis of exclusion. High clinical suspicion and prehospital history taking are the most important factors in the correct initial diagnostic workup. We suggest that spin-echo T1-weighted MR imaging with contrast enhancement be part of the imaging protocol for suspected aneurysms in the pediatric age group, especially when vasospasm is identified at routine vascular imaging. 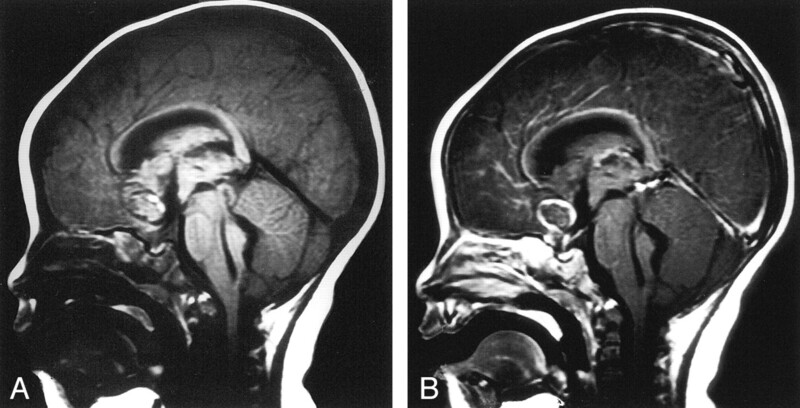 Radiographic diagnosis of intracranial aneurysm in an infant may be difficult. In our case, T1-weighted, gadolinium-enhanced, axial and sagittal MR imaging was essential in determining the presence of a cerebral aneurysm. Accepted after revision October 16, 2001.